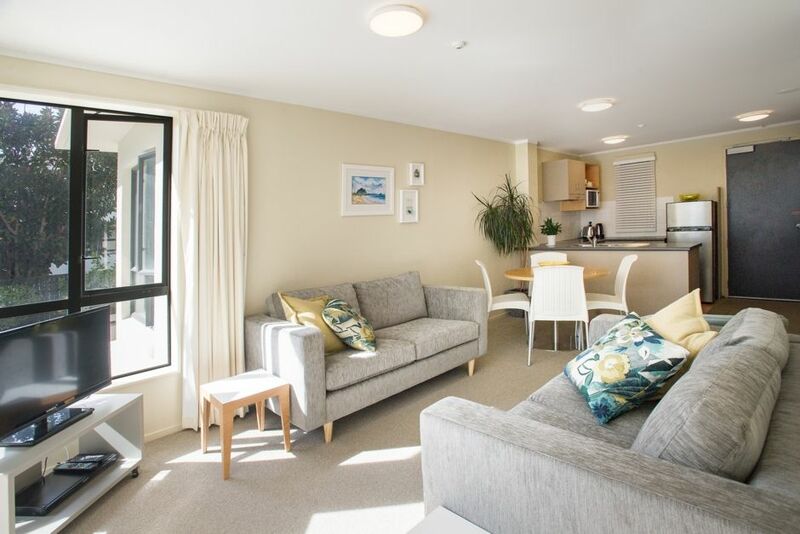 The Abode in The Atrium Apartments is situated in one of New Zealand's favorite beach destinations renowned for its surf and safe swimming beaches. Leave your car in the covered and reserved secure car park, throughout your stay everywhere is a walk short away. Main Ocean Beach -1 min with white sands and refreshing surf, Pilot Bay -2 mins with good safe Harbour side swimming ideal for young children to swim and play in, Mt Mauao tracks up and around mountain -2 mins, Mount Hot Pools (thermal salt water) -2 mins Mount Main street - 5 mins. Whether you choose to walk to the Mauao shops using the private beach access at the rear of the property or walk along Maunganui road to town there's a great choice of cafes, restaurants, bars and boutiques only moments away near Mt Mauao and along the vibrant Mount Main Street. Enjoy the fresh salt air along the way with wonderful views! Apt.104 is a one level, well appointed, newly refurbished apartment with full kitchen and laundry, boasting BRAND NEW; beds, mattresses, dining table, chairs, couches, cushions, side tables, bed linen and towels. The apartment has a balcony with table and chairs to sit, relax and enjoy views of the swimming pool, hot pool, trees and glimpses of Ocean Beach and Slipper Island. Windows face to the north and to the east. Mid-morning and early-afternoon sun make The Abode an all season getaway. Everyone's welcome. Situated on Level 1 the Apt. has the advantage of you being able to take the stairs or lift. It’s just a short flight of stairs to the hot pool, barbecue area or The Atrium’s private access path to the Ocean Beach. •	Free Internet and Sky TV are provided. Security Cameras operate 24 hours, for your protection. •	Two golf courses, tennis courts, Bayfair Shopping Mall, Tauranga City and Tauranga Airport. Tuition and equipment hire available for a variety of water sports at Ocean Beach and Pilot Bay. Stunning views of Tauranga harbour are discovered along a circuit of bike trails. The Office is open for 8-6 pm week days with onsite Managers. Included in price are extra blankets, heaters, hairdryer and free standing fan for summer. I was raised on a dairy farm in the Waikato, North Island, New Zealand. Every summer our family would holiday for three weeks in our old bach close to Main Ocean Beach, Mt Maunganui along with other family friends. All we kids learnt to swim in the ocean and to body surf as well as walk up and around the mountain frequently. Now I live in Mt Maunganui making the most of the ocean waves in summer and autumn. Mt Mauao, at the end of the peninsular is a special mountain for all of us over here. With delight I often take the tracks around and up to the top of the mountain just as we always did as children. The Abode, in the Atrium Apartments is only a 'stone throw' from our old bach in Common's Ave that our family owned for fifty years. I know this area well and love it! I decided immediately on the Abode for its close proximity to Ocean Beach, Pilot Bay, Mt Mauao walking tracks, cafes and shops. There are relaxing views from the apartment to swimming pool, hot pool, trees and glimpses of the ocean. Level 1, has the advantage of being able to take the stairs instead of the lift if you choose. The Abode in the Atrium Complex has great amenities, a private Swimming Pool, Hot Pool, Steam Sauna and Gym:- Rowing machine, Stationary Bike, Weight machine, Elliptical Machine toilet and shower within the gym complex. Security Cameras: operate 24 hours, for your protection. The Office is open for 8-6pm week days. glimpses of Ocean through to Slipper Isand. As a courtesy for guests we provide condiments; milk, coffee, tea, salt, pepper, oil, plastic wrap etc. Fully functioning kitchen with white ware, crockery, cutlery, electric jug, toaster, pots, pans tea towels etc. The Atrium office is open from 8.00-6pm. Great place to stay. So close to everything! This place was perfect for us. It isn't far to walk into town and has quick access to the beach. Close to every thing we needed. Restaurants and township 5 to 10 minutes walk. Great secure car parking. 2 minutes to the beach. Loved our stay, only let down was the lack of wi-fi. We would certainly book again. Thanks very much for your your positive feedback. The new Wifi system is going to be installed very soon so I'm very sorry for the inconvenience you experienced. Easy stroll in to the shops and restaurants. Pool Gym and spa just down the steps. Very compact and pleasant little stay. Mt Maunganui, located in Bay of Plenty, is a popular holiday resort town, renowned for its surf and safe swimming beaches. Climb to the top of the Mt Maunganui (Mt Mauao) summit and stroll around the mountain for amazing views.